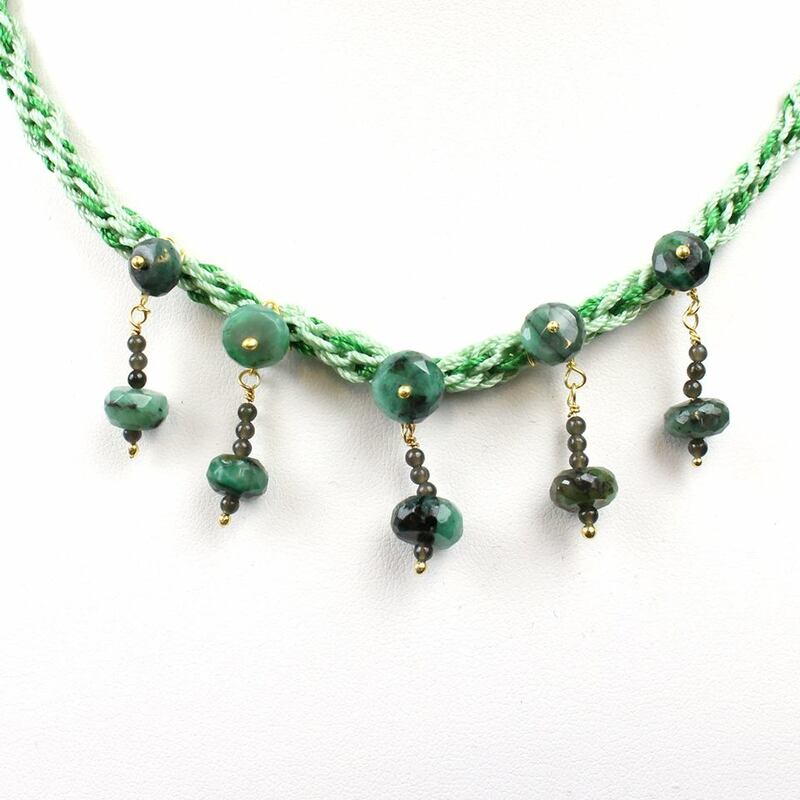 On 6.1.16 the second kit I demonstrated included lots of lovely S-Lon together with some really chunky emerald rondelles, some tiny seed beads and a strand of gold coloured hematite hearts. For this kit I wanted to show how unbeaded kumihimo can be elevated by the addition of some simple embellishment or connectors. None of the beads in this kit were added into the braid during the braiding process. This bracelet was demonstrated on the show. 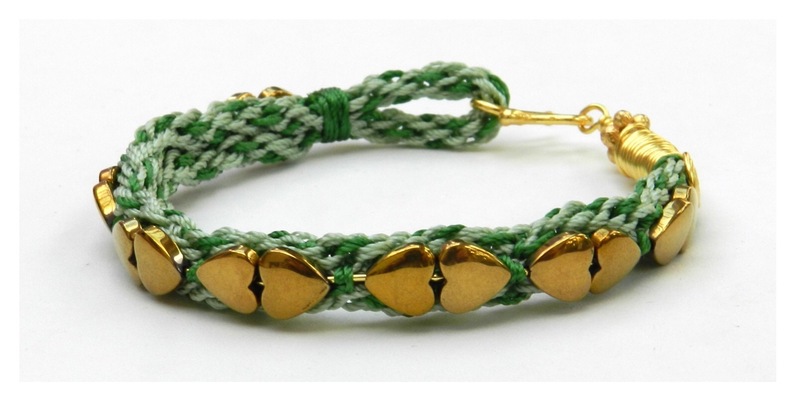 You will need approximately 50-60cm of finished braid to make this bracelet. The braid structure is 8 cord Round Braid. 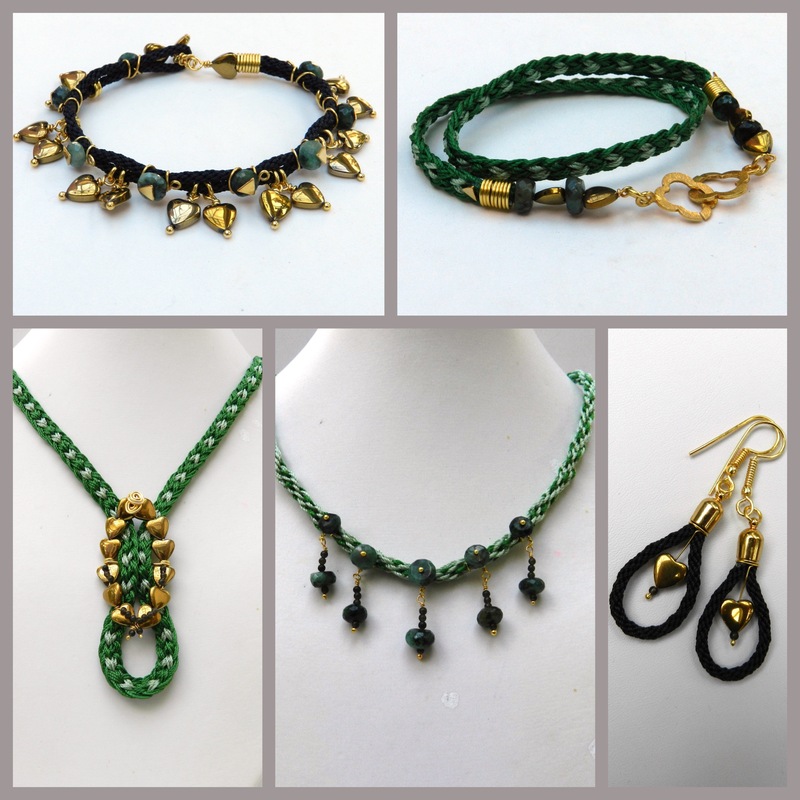 Any excess braid can be used to make earrings. Fold the braid in half. Thread an emerald onto a headpin. Not all the emeralds in the strand will fit onto a regualar headpin. But you should have enough to make this bracelet. If not, just use the ultra-thin headpins. Pass the headpin between the braids about 1-2cm from the fold. This needs to be large enough to accommodate a toggle. Wrap the headpin around both braids, first to one side of the emerald and then to the other side. Finish off the headpin with a small spiral on the front of the bracelet. Thread 2 5mm jumprings onto one of the braids and repeat step 2 to form a join about 1-2cm from the first join. Repeat along the length of the braids until the bracelet is the correct length, minus the clasp. Attach hearts on wrapped loops to the jump rings. Bind the braid together with thread and glue the binding and 1cm of braid beyond the binding. When the glue is dry cut through the braids. Make a 1cm coil using a 0.4 mandrel. Hook a headpin between the braids and bend it up along the end of the braids. Thread on the coil and a bead. Half form a wrapped loop. Thread on a toggle and finish off the wrapped loop. I demonstrated on the show how to attach gemstones to a braid with headpins. The key to success is not to let the braid get twisted and then the gemstones will line up correctly. However, it is easy to remove and reattach a stone if necessary. Simply thread the stone onto a headpin and pierce the braid. Wrap the headpin around the braid, first on one side of the stone and then on the other side. Form a wrapped loop and other charms can be hung from this loop. 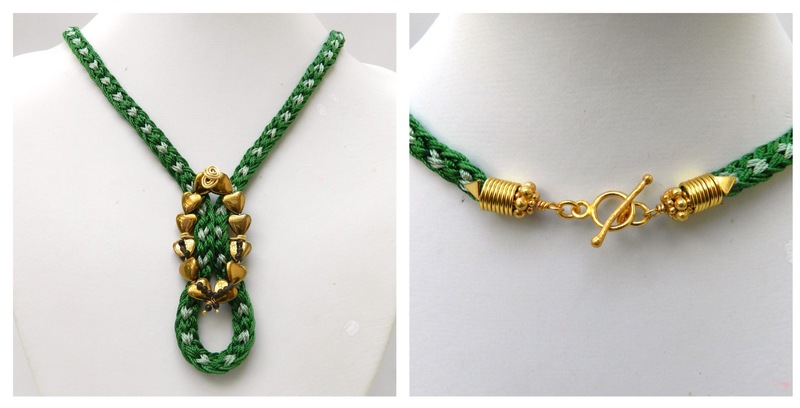 The braid for this necklace is Half Round Braid with 3 cords per slot. The central focal is a buckle, made by threading hearts onto wire, forming an oval and attaching a bar across the middle. The braid structure for this bracelet is Half Round Braid. This is a great way to use up an offcut of kumihimo. Simply wrap twice around the wrist and add extra beads if necessary to make up the length! This bracelet was a bit of an experiment and I plan to develop this idea and perhaps demonstrate it on a future show!